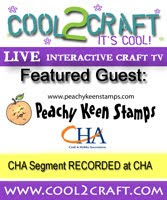 The ThINKin' Spot: Peachy Keen Mini Release and Debut of Country Bumpkin Stamps! Peachy Keen Mini Release and Debut of Country Bumpkin Stamps! Leave a comment below telling me what inspires you for a chance to win. 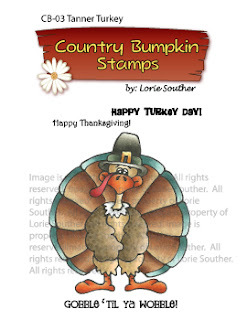 I'll give away one of each Country Bumpkin Stamp sets on Monday morning!! Good morning! Today is a BIG day around here, because Peachy Keen Stamps is having a mini release, and as a part of this awesome release, (they're ALL awesome, BTW ) the Country Bumpkin Stamps stamp line is debuting, and those just happen to be images that were drawn by none other than ME!! Yeah, you heard correctly, and I still can't even believe it!!! Country Bumpkin Stamps are inspired by people, places and things from right here smack dab in the middle of this country where I just happen to be blessed to live. You'll find cute and whimsical images to color from Little Max and Madisyn (both of whom I personally know) to Tanner Turkey (I happen to know this fella, as well) and everything in between. I hope you like them, and that they will inspire you to create wonderful works of art for you to share and enjoy! I have to send a HUGE thank you to Kathy J., for her help, encouragement, and inspiration. After spending some time with Kathy and her sketch books full of inspiration, and hearing her encouraging "You can do this!" words, I FINALLY had the courage and inspiration to try. There's no way to truly express here what that means to me, but Thank You from the bottom of my heart is a good place to start!!!!! 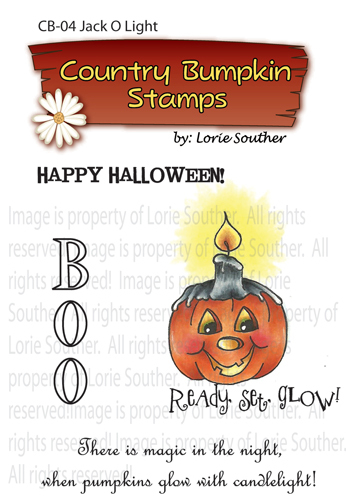 So with all that being said, I give you my first creations from the first six sets of Country Bumpkin Stamps!! I sure hope you like 'em, because they're near and dear to me!!! This Country Bumpkin Stamp set is entitled "Max", and inspired by the sweet little blonde bundle of energy that calls me... Well he doesn't talk much yet, but, Grandma, Nana, Mimi, or WHATEVER (within reason) he decides to call me will be just fine with me!! I drew this little guy up, and sent it to Kathy for approval, and she sent him back to me with more of those encouraging words, saying she loved him, but she thought he needed a frog, or snake, or something like that included. I set to work, and drew a pocket for his overalls, with that frog trying to get out, and we both decided that was just the ticket. Several days later, I stumbled upon this anonymous poem about a little boy, and I knew it HAD to be a part of this set!! It couldn't have been more perfect!!! Little Madisyn is inspired by my niece Madisyn, whom we waited a long time for, but was she EVER worth the wait!!! She's as pretty and sweet as she can be, and pulls off lace and frills so very well, but is the happiest when she's wearing her overalls and boots, and doing anything outside, but she always looks adorable, no matter what her state of dress, AND her lip gloss is never far away!! This Goblin guy evolved from... Well, I'm not exactly sure!! LOL!!! He's inspired by garden gnomes and Halloween, which is as many of you well know, my FAVORITE holiday. Not so much for trick-or-treating and all that, but more for the time of year. I LOVE this time of year!! Along with our annual hay ride, carving pumpkins is a cherished tradition around here, and believe me when I tell you, we carve plenty of them. I definitely think it's true that "There's magic in the night, when pumpkins glow with candlelight." And last, but certainly NOT least, we come to Tanner Turkey. Now this guy is inspired by my larger than life nephew Tanner, who always has a smile on his face, and can bring a smile to your face just by looking at him, but ESPECIALLY if he's telling one of his stories! Mission accomplished here, because every time I look at Tanner (either one), I can't help but smile. 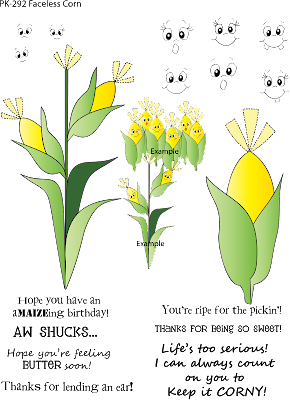 If you'd like even more inspiration, please hop over to a few of my friend's blogs who have wonderful creations to share with you made with Country Bumpkin Stamps. They were so sweet to help me out by making something on very short notice, so please give them an extra special thank you and leave them LOTS OF LOVE! 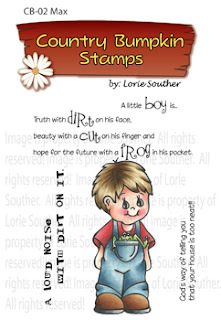 So, here ends the debut of my Country Bumpkin Stamps creations. As is usually the case, all images were colored with Copic markers, and since this post is a long one, I'm not mentioning what specific supplies I used, but if you have a question, or would like to know specifics, please don't hesitate to drop me an email. I'd be happy to share that info!! In celebration of this release, I want to give away one of each of these Country Bumpkin Stamps sets to my readers, so if you'd like to win, just leave a comment here telling me what inspires YOU!! You'll have until Monday morning to enter, and although it's not a requirement, I'd love it if you would were a follower!!! I'll choose random numbers as winners for each set, and please don't forget to leave me some contact info so that I can let you know when you win! I hope you don't think this post is over, because I've still got peachy goodness to share with you. Peachy Keen Stamps is releasing 4 adorable stamp sets today, and they're some of the cutest EVER! I haven't inked these babies up yet, but I'm fixin' to just as soon as they're in my inky little hands!!! I know you're going to LOVE each and every one of these!!! Here we have the adorable Faceless Corn stamp set complete with adorable faces, and hilarious sentiments for all your Fall card making/scrapbooking needs. This set is a MUST HAVE!! 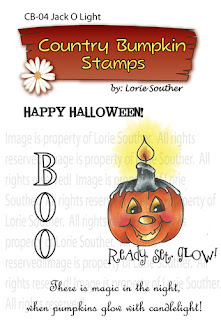 Now if this Fall Blessings stamp set doesn't have you laughing out loud, I don't know what would! 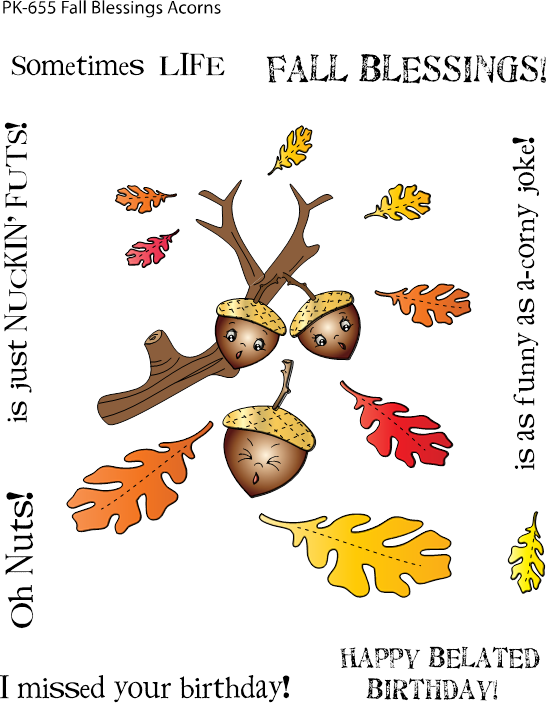 Those acorns are just the cutest, and there's some very "punny" prases to go along with them! ANOTHER must have. Finally, here we have the Uglies!!! Oh my goodness, do these EVER inspire me to get that Cricut humming, and I just got a new monster cartridge the other day, so that's EXACTLY what I'll be doing very soon!!! 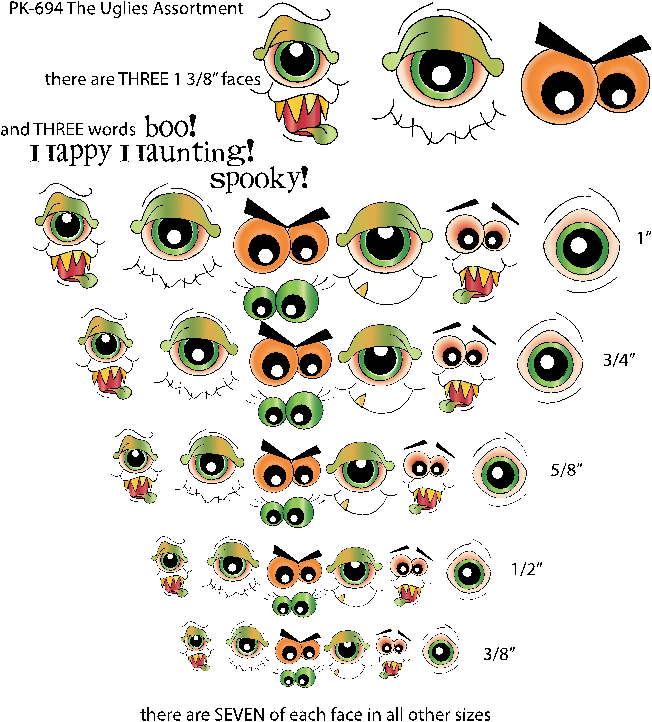 These adorably ugly faces will make some of the most wonderful cards and layouts EVER!!! Thanks so much for stopping by today! It's always wonderful to have you, but it's especially wonderful to share this special day with you!!! Have a blessed day, a fantastic weekend, and I sure hope you get to do some happy stamping!!! Love, Love, LOVE your new stamps! What inspires me--all of the wonderful friends and their blogs that I have met online! Good Luck with your new line! Love your cards, too, what's not to love?!?!?! I am so darn excited for you! Congrats to you on your Country Bumpkin line and the PKS on their new releases! Such fun!! Your cards are beautiful and made even more special by you using "your" stamps!!! LORIE!!!! I knew that was your AMAZING coloring in the sneak peeks so I thought it had to be you! You are a woman of MANY talents!!!! These new stamps of yours and Kathy's are AMAZING!!!!! Of course I would love to win some but if not I'm going to have to buy some. Can I tell you they are all adorable but that TURKEY is the CUTEST TURKEY EVER!!!!!!! So what inspires me... my family, nature, music, scriptures, friends and BEAUTIFUL creations like yours! I could not be happier for you sweet friend!!! Absolutely love them! Congratulations....I am so, so excited for you, they are so cute. Lorie - I love your new release and as I told you before am absolutely in awe! Wow, girl! You hooked me! I've always loved the Peachy Keen, especially your creations, but now that YOU have YOUR OWN stamps there I just have to go SHOPPING! Congrats, Lorie! These are all sensational! Big hugs! Congratulations, my dear friend!! I'm so thrilled for you...and I'm thrilled for the rest of us too because we get to buy such an adorable new line of stamps!! I'm so proud of you! You have such an amazing, God-given talent and I'm so excited that you took that leap to share it in this new way with all of us! Big hugs to you and best wishes always!! I'm off to shop! Love ya! Lori, you are my inspiration. I always enjoy all the cards you create. Congrats on this new adventure. You are very talented. Omg Lorie these are fantastic. I really don't know what inspires me other than all my blogging buddies. If it wasn't for these blogs and the friends i made on here i would go stir crazy. WOW! AWESOME!! FANTASTIC!!! ADORABLE!!!! CONGRATULATIONS ON YOUR COUNTRY BUMPKINS, LORIE! I'm loving your darling images of Max and Madisyn and Tanner Turkey and all the rest!! You are so creative and I am so excited because I knew this day was coming soon...So glad to see it now!!! I'm buying! I'm buying!! You are my inspiration, girl!!! 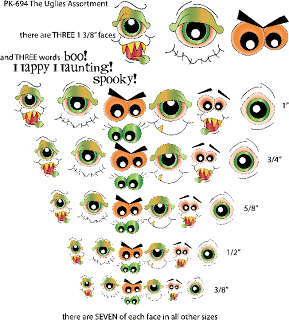 These creations are so cute? Inspiration? Why I get that from you, of course. Spring and Fall are also great inspirations. Lorie, I got so excited this morning that I forgot to say what inspires me. My creative friends! I just love the style of your images! You are inspiring me to get into Halloween and get some silly scary stuff made. Congrats!!!! Wow, these are great, I am already a follower and glad I am!! Thanks for the chance to win! I hope this doesn't come through twice. I wrote it one and I don't know what google did with it. It just sent me here because I didn't add a cell #. I love you Max and Madisyn. They are adorable. Madisyn looks a lot like my 2y/o Grand daughter Addison with ponytail and all. They all are adorable. some day I hope to color just like you. Congrats!!!! They're adorable! I'm a big Halloween girl myself, so I'm totally LOVIN the Goblin Greetings! That's for sure my easy fav! Love the owl & turkey sets, too! Super cute! Big congrats & best of luck!!! And thanks for a chance to win, too! I do believe you know how much YOU inspire me! But, so many other things can and do inspire me....the sun rising, a bird chirping, my husband laughing.....just to name a few things! Lorie -- I am so happy for you with your new line of stamps. I can't wait to order them. You were my first inspiration and still continue to be my inspiration for creativity!!! You Rock!!! Oh Goodness Lorie and Congratulations!! your stamps are Adorable...Might God continue to bless your talent! Your stamps are so adorable!! I love their eyes! You are a true artist! I love browsing blogs and crafty pages for inspiration and found it here for sure! Congratulations! These are bound to be a big hit, Max and Madiysn are just adorable and that owl is a total hoot! I get inspired by all sorts of things and people. Never know when or where inspiration will strike. Off to see what your friends did with your "babies"! Oh so excited for you!!! Your stamps are adorable. I knew you could color so beautifully and your drawings and designs are just as wonderful. Congratulations!! Many of the different creations on blogs inspire me. I love your new stamps. I saw them on the Peachy Keen website today and I just had to have one so I bought Max. He's so super cute!! I am so happy for you and your new venture! I LOVE LOVE LOVE the stamps! They are darling. Good luck and keep up the good work! What inspires me? You and they way you make everything look so easy and beautiful. You are amazing at everything you do! I've always admired your many talents, from crafting to cooking. Wow Lorie..Congratulations!!! You should be very proud of yourself, these are down right a cute as can be!!! At Thanksgiving I like a different turkey to create with, so your Tanner fits right in, he is adorable. I can also relate to Max, kind of reminds me of my youngest when he was little (16 now). He was always digging around in the dirt & bringing home all sorts of critters! Thanks for a chance to win one of your Fabulous stamp sets & again congrats!!! All of the stamps are wonderful. They inspire me to want to make all sorts of great things with them! Just love your stamps they are so adorable!! Following your blog and seeing all the peechy keen stamps inspires me to start getting creative in making holiday cards. Congratulations on your new adventure. Your Stamps are all Fantastic!!! Your stamps are so great. What inspires me the most are blogs. There are so many talented people out in cyberspace who are willing to share their talents. Lorie, great job and congratulations to you! I think the owl stamp is my favorite! I think I'm always on the lookout for inspiration - and end up finding it in strange places! 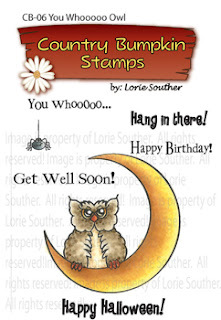 Lorie, these are wonderful, love your stamps. You are an inspiration, well done and more to come!!! am also inspired by seasons, & holidays. The new stamps are adorable. All of these wonderful people I am meeting on the blogs are truly inspirational! Keeps me wanting to create! Congratulation on your new own stamp sets. Wow , amazing !! I know you are a very talented person and i´m very happy for you. Congratulations on your new line! ALL adorable! And I love your fabulous coloring! Wow what absolutely ADORABLE creations! 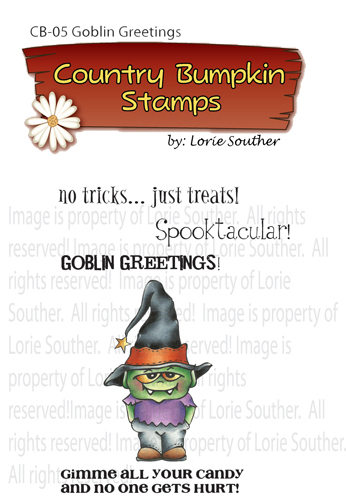 I am in love with those Country Bumpkins and Halloween is one of my favorite times of year and your Halloween cards are FAB! Your turkey card just makes me smile. Thanks for all the wonderful inspiration. Hi Lorie, Congratulations!!! Your stamps are just adorable. I love them all. And I just adore the name Country Bumpkins. So cute! I think that life is my inspiration, it changes dailey. I never know what one little thing will inspire me to create something. It always amazes me. Lorie my lovely. Tears of joy for you ~ one of the few time that I don't hate crying (though everyone is looking at me weird - I'll blame it on the Packers - LOL). This is so exciting and I cannot think of anyone more deserving. You are soooo talented and inspiring to me and to a whole lotta others I'm sure. Huge hugs to you and I can't wait to see what you draw up next! cute stamp sets! I am inspired by my children and all of the things I see on all the blogs!! I love to hop around and see all the creativity you guys share with us! thanks for all the great projects and inspirations!! The thing that inspires me is getting to see all the beautiful things people like you create. You give me ideas on how and what to do. I am new to this and the more I find out about it, the more I realize there is to learn. When you get to my age it is always good to keep the old brain learning new things. You all are so generous it is inspiring to learn from the best designers out there. Thank you for sharing. Hi Lorie, I think I know where you got your inspiration for the little boy country bumpkin. The little darling who's picture you shared with us. He would be an inspiration to anyone. But the little boy sure looks like him. The whole collection is great. All my kiddos are grown but I get a lot of inspiration from the beautiful grandchildren they gave me. I need to learn how to do this so I can teach them and perhaps also instill in them the desire to create wonderful things to share with others.Passing knowledge from one generation to another is the best gift one can give. Thank you for sharing. Congratulations! Your stamps are super sweet! I'm inspired by all the talent out there! Wow! You are super talented! I just finished my introduction to copic coloring class and now I'm on to Copic Coloring I class, I hope to be as good as you are some day! Great job! Just love all the stamps, so cute. Congrats on all your new sets, they are sooo stinkin' cute!! I don't, as of yet, have any Peachy Keen stamps, but have been wanting some for quite sometime now. What a great way to start off but with yours! You and all these ladies are so talented, what a blessing to the paper craft world! TFS! Congrats lorie, they are all so cute. I want them all. Awesome cards. Love the frog in Max's pocket. 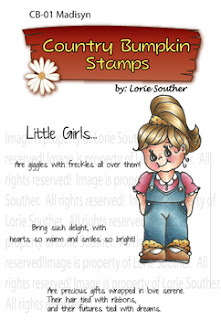 Love the new Country Bumpkins stamps. They are adorable and just as cute as a button.